Italy's location on the Mediterranean Sea meant innumerable beachfront cities and resorts. There was a brisk trade in beach buggy conversions of regular cars by the many specialist coachbuilders throughout Italy at the time. One such specialist was Ghia (now owned by Ford), who created the Jolly conversions on Fiat's 500, 600, Multipla and Giardiniera platforms. This particular car was bought by a wealthy Italian artist/painter in Alassio, near Liguria, a world famous beach resort. It was personalized by him with extra wicker, a chrome rail and a custom storage compartment. 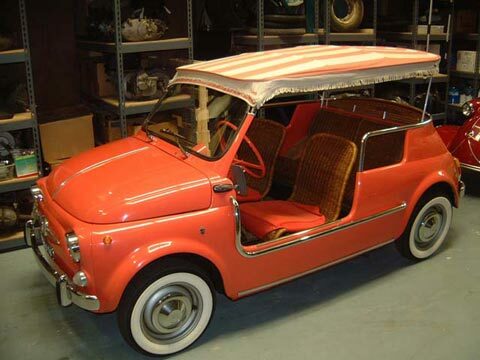 A well-known Canadian Fiat enthusiast owned it for many years. Its original "Jolly" badge is the only one known to exist among the forty-odd survivors.